In the "Dark Ages" of my blog, I would post recipes without photos and sometimes no recipe -- just a link to another site. I often remake several of these favorite recipes for my family, so taking a photo wouldn't be an issue. Would you like me to occasionally repost these recipes with pics, or would you prefer I just focus on new ones? The resounding answer was YES! 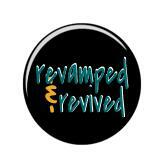 So today I am introducing Revamped & Revived. I occasionally will repost favorite recipes from my blog. Sometimes I'll share tweaks to the recipe. Sometimes it'll be the exact recipe as was originally posted. Regardless, it'll bring to your attention some of my family's favorites from over the years! So here's my first R&R recipe: Salsa Chicken. The original post only linked to a recipe over at A Year of Slow Cooking. 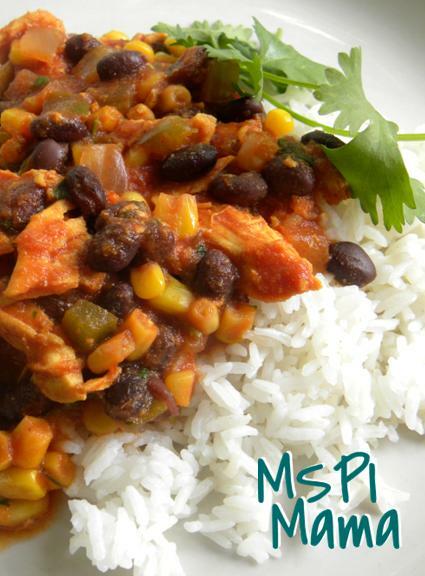 I've actually been making this recipe for years ... long before I ever was on the MSPI diet. I'm going to share with you how I've tweaked it over the years. (I've also included Stove Top Directions.) I honestly don't measure the ingredients. I just eyeball the salsa, corn and seasonings. However, this is a pretty close approximation of what I use. Combine the first five ingredients in your slow cooker. Nestle the chicken into the mixture, making sure to fully coat the breasts. Place the lid on the slow cooker and cook the chicken on high for 2-3 hours, on low for 4 hours or until the chicken is fully cooked. Remove the chicken from the slow cooker. Allow the meat to rest for a few minutes. Chop or shred the chicken and return it to the salsa mixture in the slow cooker. Stir in the cilantro. Adjust seasoning to taste. Serve with hot cooked rice. Stove Top Directions: Follow the same steps as above, but add 1 cup of water to the mixture. Heat in a large pot on medium-high until the mixture begins to bubble, turn the heat to medium-low and simmer for about 20 minutes, or until the chicken is cooked through, stirring occasionally and adding more water, if necessary. Remove the chicken and chop or shred it. (If the salsa mixture is too thin, turn the heat up to medium-high and simmer to preferred consistency.) Add the chicken and cilantro to the pot and serve.